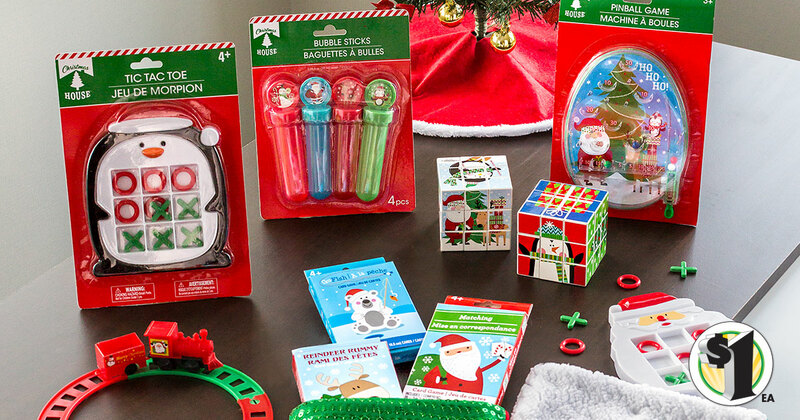 This is a sponsored post with Dollar Tree where Everything's $1 and you can find Cheap Holiday Décor. This post also contains affiliate links and I will be compensated if you make a purchase after clicking on my links. I have always been a frugal person. I love to do it my self when I can, I like to save old stuff and re-purpose it, and one of my favorite places to shop for Cheap Holiday Decorations is definitely Dollar Tree. 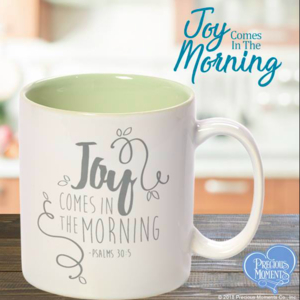 Besides having a variety of stuff to choose for only $1, they also have a ton of other great stuff like stocking stuffers, back to school products, etc. I have put together a great list of DIY Holiday décor that you can make with stuff you can easily find at Dollar Tree. 1. JOY Holiday Wreath by Amber Oliver - "Spread a little joy this season with a JOY holiday wreath for your front door or to hang up in your home." 2. A Thrifty Hack & Step By Step Guide to Decorating a Scraggly Tree on a Budget by Small Stuff Counts - This is such a useful trick if you have a cheaper Christmas tree and need to fill in those annoying gaps or if you want to spruce up an artificial tree. 3. 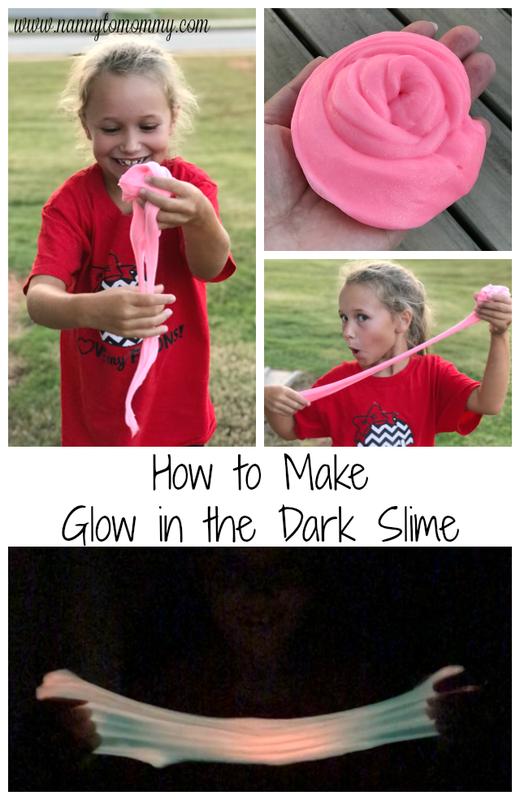 How to Repurpose Halloween Décor into Christmas by Michelle's Party Plan It - She used a witchy jack-o-latern that was found at Dollar Tree. 4. Simple Festive Christmas Decor for the Stairs Railing by Trisha Dishes - "but the railing becomes essentially non-existent, and guests are forced to use the wall for balance. No one wants hands rubbing all over the walls. ..We had to come up with another solution to decorate without covering the railing." 5. DIY Christmas Candle Holder by One Crazy Mom - "Try this DIY Dollar Store Christmas Candle Holder that takes only minutes to make and leaves a festive glow for your home." 6. Easy DIY Snow Globes by One Crazy Mom - "There is something so magical about snow globes. They are simple yet stunning! ...These little globes full of wonder and awe never get boring! 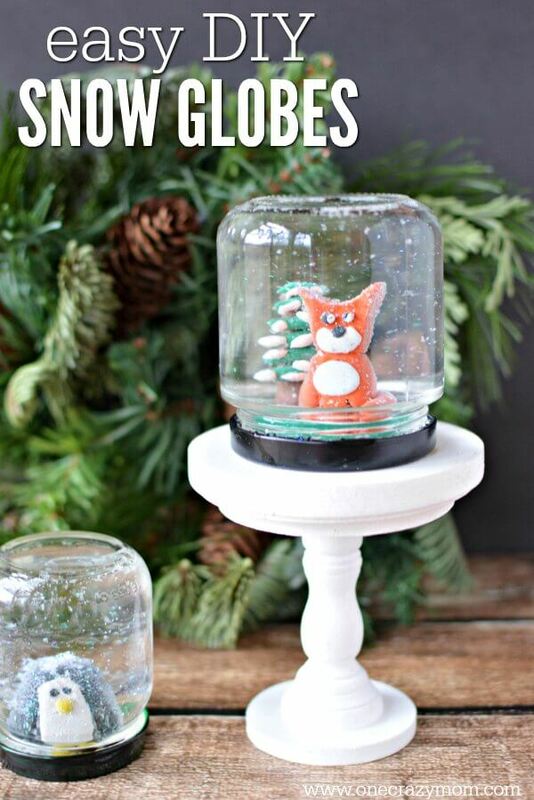 Whether you are a child or a kid at heart, everyone loves snow globes." 7. Easy DIY Christmas Card Display by Small Stuff Counts - "This DIY Christmas card display is simple to create and makes a fun place to display all of those pretty holiday cards." 8. Miniature Christmas Village from Holiday Cards by What's Up Fagans- This is such a unique way to repurpose left over holiday cards or ones from year's past. 9. 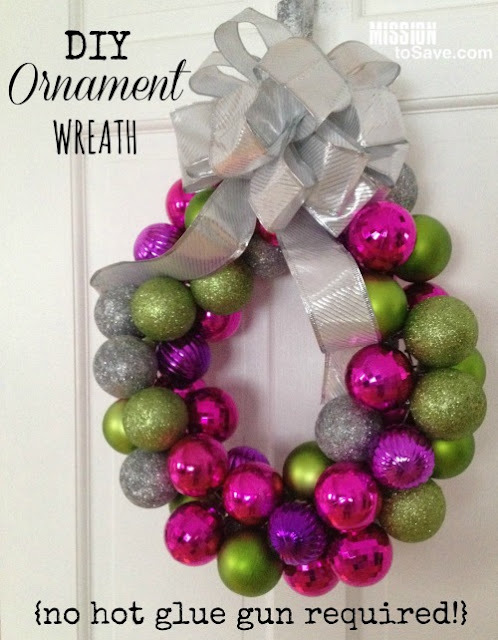 DIY Ornament Wreath by Mission to Save - This is so thrifty since it uses a wire coat hanger and no hot glue is required! 10. Upcycled Advent Calendar by Organized 31 - Advent calendars are so much fun to not only count down the days until Christmas, but you can use to learn the Christmas story as well. I love this repurposed advent calendar made from an old record. 11. Cheap Holiday Table Décor by Uncommon Designs - I love this design because it is so easy to recreate and everything can be found at Dollar Tree! 12. Magical Christmas Lanterns by Projects with Kids - "Start saving your jars, these magical Christmas lanterns are so fun and easy to make, you and your kids will love making these! They look absolutely stunning lit up with a candle inside and would make the perfect addition to any holiday decor." 13. Upcycled Bookshelf DIY Nativity Scene by The Soccer Mom Blog - This craft is so easy, uses many things found around the house, and it such a unique idea - I absolutely LOVE it! 14. Upcycled Book Page Wreath by Organized 31 - I love the unique look that the book pages give. 15. Spirited Candle Holder by Mission to Save - "With the holiday season quickly approaching it’s time for gift giving. And that means for teachers, neighbors, and gift swaps too. The list of how many of these gifts you need to give can start to grow long. So here is a fab, festive and frugal idea." 16. Christmas Angel Decoration Tree Topper by Dollar Tree - "Looking for a new addition to your traditional holiday decorations? Add a personal touch to your décor this year with a homemade Christmas Angel, complete with silvery wings and halo. 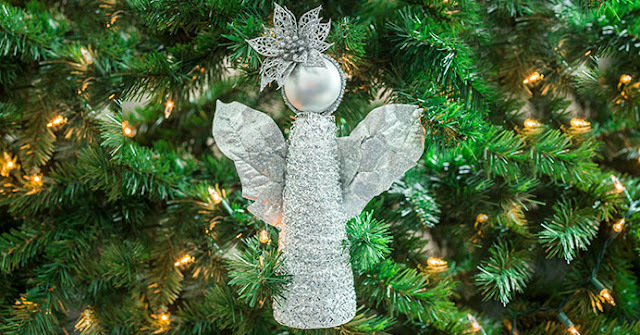 An easy-to-make craft for the entire family, shimmery angels can be displayed in Christmas trees as ornaments, on tabletops or counters as part of a festive centerpiece, or used to embellish wrapped holiday gifts. 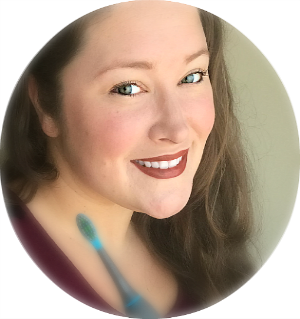 You can shop at Dollar Tree and pick up most of the necessary supplies for just $1 each!" 17. 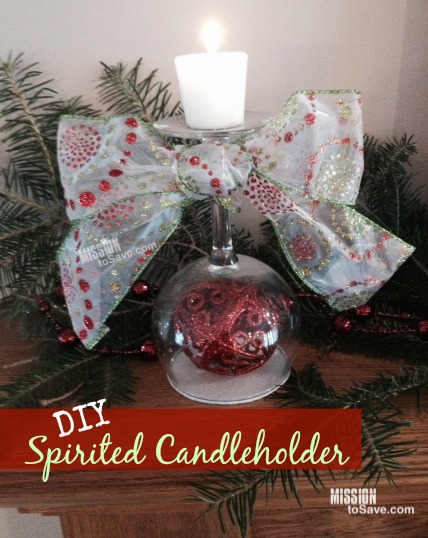 DIY Garland for Christmas Tree by AprilGoLightly - "Garland is a versatile decoration. String it up on the banister, around the tree or along the wall – it works just about everywhere! I made this DIY Garland to decorate for Christmas because I wanted to add a special home made touch to our mostly store bought wares. Try this festive Snowflake Garland to add some sparkle and shine to any space." 18. Tissue Paper Christmas Tree by April Golightly - "You can’t break it if it is made out of paper and we won’t cry if it rips since it barely costs a dollar to make." Which idea was your favorite? Do you have any cheap, frugal, or upcycled holiday décor ideas of your own? Please share in the comments below! These are cute ideas. I really like the ornament wreath! I love these ideas, they are so cute! 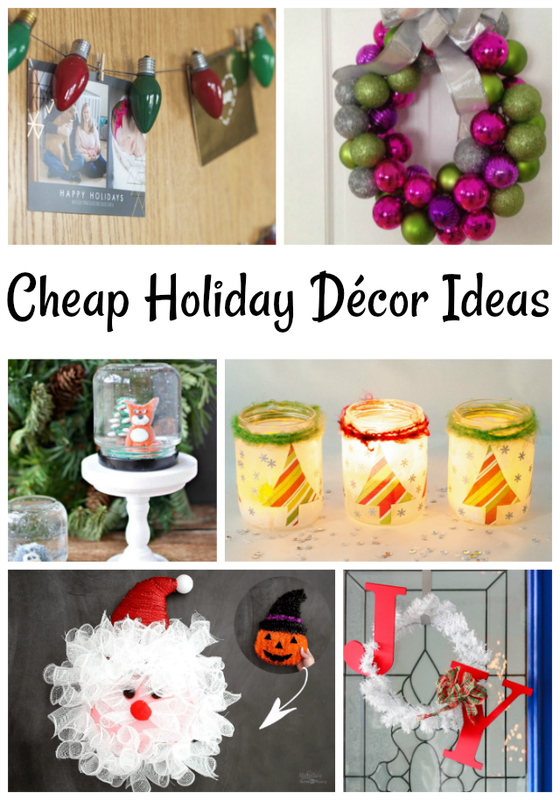 These are all great ideas, I love Holiday decorations! I love going to the Dollar Tree, where everything is $1 to get all of my crafting and DIY supplies for it. :) Thank you so much for sharing these! Dollar Tree is one of my favorite stores. When you are on a tight budget this store is great for all types of decor. Dollar Tree is my go-to store for all kinds of crafts. Good selection and great prices. I love the snow globes and the old fashioned lights. Thanks for posting! There are some great ideals here. Besides the dollar tree I like going to Goodwill/thrift stores. Nothing like picking up this odd item and letting your mind go wild on what you could do with it.